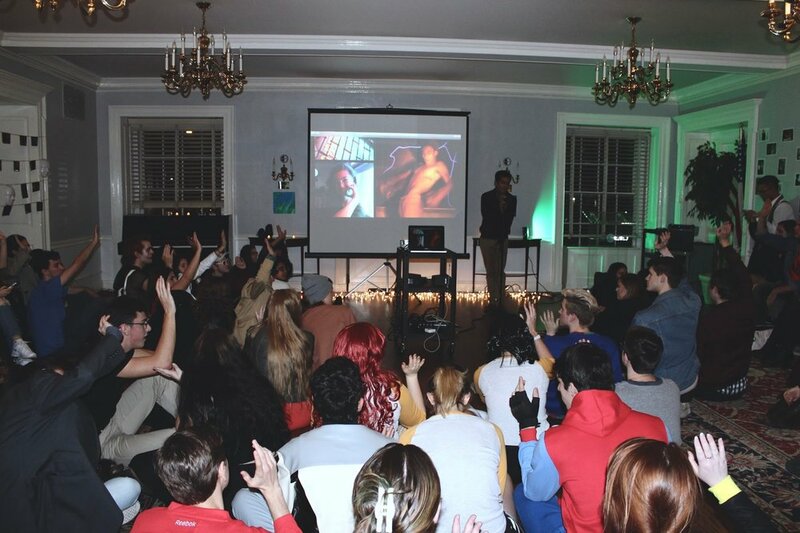 While many enjoyed Halloween night trick-or-treating or masquerading as ghastly ghouls and naughty witches, Blended Magazine hosted its first-ever viewing party! Miskat Rahman Performing "Monophobia: The Fear of Being Alone"
In honor of premiering the student-produced film, Floating, the hashtag, “BlendedxFloating” dominated the night and days following the celebration of local art. Characterized by performances and galleries by local artists, the BlendedxFloating viewing party stayed true to Blended’s values of creating a platform with a perfect mix of music, art, culture, and fashion. Held from 7 to 8:30pm in the Regina Peruggi Room of Marymount Manhattan College, the entirety of the room had been turned into a custom gallery comprised of work by local artists. Upon entering the venue, you could see that an entire wall had been dedicated to showcasing poetry complemented with various artwork by visual artist, Emilea Gardner. Her abstract artwork featured watercolor images evoking images of nature and landscapes with textures of mercury, representing the coexistence of colors and body parts. In addition, Gardner also displayed work that showcased her free-spirited use of acrylic on canvas, showing movement and flow in her pieces through her choice of medium. Opposite the poetry gallery was an entire wall of the venue covered in artwork by visual artist, Daniel Morrison. His colorful artwork showcased themes of beauty, women, fashion, and hair through his acrylic and watercolor paintings. Next to Morrison’s gallery was a constructed photo booth comprised of cinematic Floating photos created by Drew Gannon. Other featured work included still photos by Hayley Talbot and Kobi Ross. The venue had truly been set up to not only showcase the creative expression of many local artists, but also to provide viewers with an encouraging opportunity to reflect and interact with the art. The night began with an extravaganza of spoken word starting with me performing “Monophobia: The Fear of Being Alone” followed by David English and Andy Van Sader’s riveting monologues. Reconvening after a short intermission, the night continued with a passionate spoken word piece by Nathalie Hughes titled “Eat." Keeping up the momentum (highly typical of a Blended event), Victoria Testa closed the performances of the night by singing covers of Annie Lennox’s “I Put A Spell On You" and Dua Lipa's "New Rules." 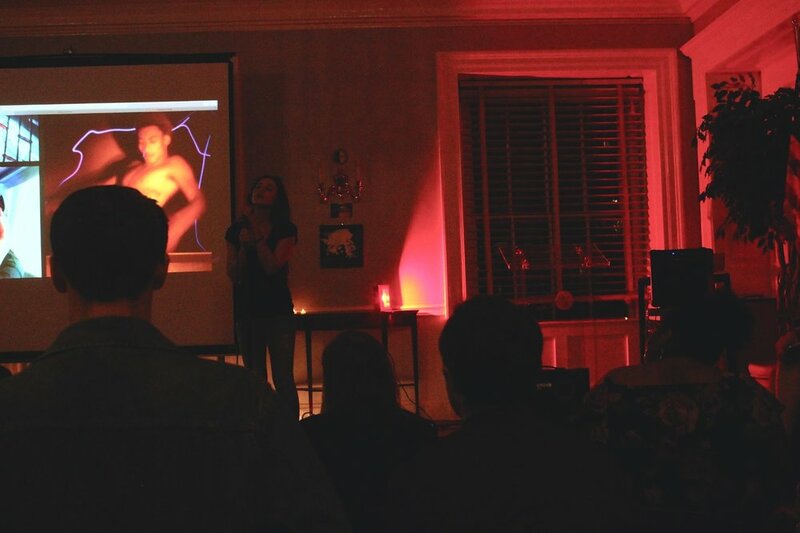 Upon the conclusion of the performances, the premiere of the student-produced short film, Floating, was underway with much anticipation and suspense from both cast, crew, and audience. Directed by Flynn Osman and Tirece Cheshire, this film reads like an 80s horror movie, with interwoven connections between seemingly different characters all unified by the same supernatural experience. Leaving much of the film open to interpretation by the viewer, it created a huge amount of suspense, as the anticipation and uncertainty within the film was surely unique to its directorial vision. Having been only Blended’s second event, more than half of the audience were newcomers to the Blended experience. As Flynn Osman and Tirece Cheshire decide to go forward with their short film Floating in film festivals and various local film events, Blended Magazine hopes to continue to support incredible work that local artists like them, and many others, continue to produce.